Technology is transforming how students and colleges utilize student IDs. Entrust Datacard™ provides secure and innovative ID card solutions to create exceptional student experiences that meet the unique needs of both Generation Z students and school administrators. Learn more about our software solutions for Higher Education. Learn more about connecting to and communicating with Generation Z. Find out how we can help you address your card administration challenges. Meet and exceed the high expectations of Gen Z students with contactless One Card solutions that provide access to the dorms, library, fitness center, cafeteria, book store, campus events and more. Issue ID cards with smart chips, magnetic stripes or radio frequency that can be programmed and used to pay for meals, do laundry and enter secure facilities. Learn how a personalized ID card can impact the student experience on campus. Use as payment for meal plans, cafeterias and coffee shops. Access sporting events, plays, concerts and other campus activities. Enter dorms, classrooms and other secure facilities. Use for conducting laundry and vending machine transactions. Access benefits in libraries, copy centers, computer labs and more. Confirm identity for online or in-person class registration. Capitalize on student and staff discounts offered by local merchants. Integrate your school ID with local transit companies to create added value. Find out how we can help integrate One Card solutions on your campus. Simplifying the issuance process and making it highly personalized are key to a best-in-class student ID card program. Our server-based software lets you capture student photos and demographic data anywhere on campus. It also allows you to print at multiple locations or batch print IDs at your convenience. This helps streamline the entire photo ID card process – and students will love that there are no long lines on orientation day. Is distributed enrollment and issuance a better, more efficient option? Learn how new technology and deployment options can energize your campus ID card program. 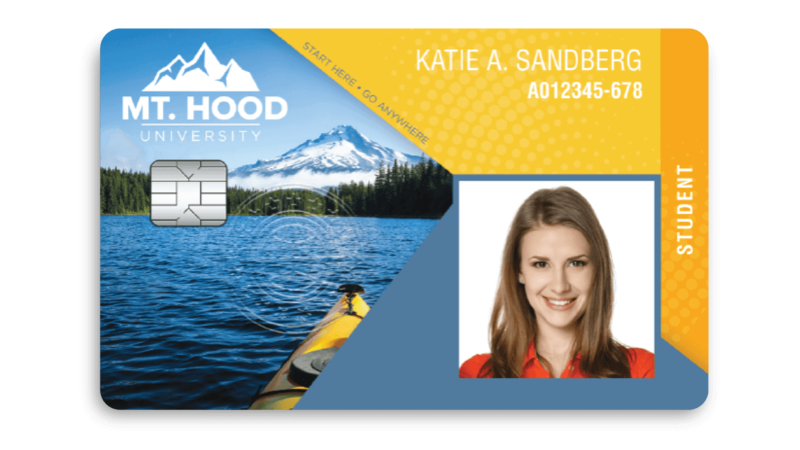 The flexibility of our card design software makes it easy to customize IDs for each student while maintaining your school’s brand guidelines. Our advanced card printing technologies allow you to deploy smart cards, RF cards, magnetic stripes and other machine-readable technologies, providing seamless integration with access control systems across your campus. Create highly customizable ID cards that comply with your school’s branding standards. Provide Gen Z students with ID cards that reflect their individuality. Reinforce your brand image with vibrant color and precision print quality. Save on ID issuance costs by producing long-lasting ID cards on demand from blank card stock. Issue technology-rich cards that integrate seamlessly with access controls and other systems on your campus. Entrust Datacard has more than 40 years of experience working with university card program administrators to develop innovative education ID solutions. We offer a range of student ID card printers to meet your specific cost, functionality and aesthetic goals, including highly reliable print engines that deliver best-in-class card quality and long-term reliability. See how a personalized campus ID card can help create a 5-star experience for students. The modular design of our software and printers allows you to add new features quickly and affordably — and protect your investment. Add innovative branding and enhanced security to your ID cards with our exclusive tactile impression feature. An available program ensures that your ID card operations remain productive — even if one of your printers requires service. Easy-to-order printer supplies — including ribbons and holographic overlays — are designed to extend card life and reduce reissuance costs. Please contact us to speak to a sales associate or request a demo. Maximize productivity and increase ID card issuance efficiency with the industry-leading features of the Datacard® CD800™ card printer.